Fulton-El Camino Recreation and Park Dist. 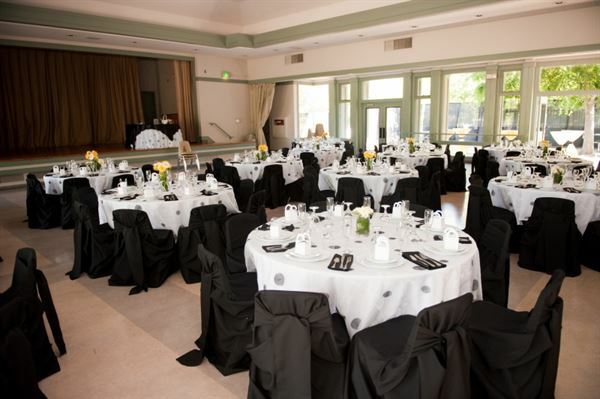 Whether it’s a wedding reception, anniversary, Birthday party, or Business meeting, we have a beautiful facility to meet your needs. The Richard T. Conzelmann Community Center is a very popular venue that features an eight-burner commercial range, triple sink, and side by side refrigerator and freezer. The auditorium is a 50' x 57' room decorated in soft gray and sage green. The side walls consist entirely of floor-to-ceiling windows overlooking patio areas to the park on one side and Howe Pond on the other. Special Features: The facility features an eight-burner commercial range, triple sink, and side by side refrigerator and freezer. There is a Gazebo area next to the pond that will seat 100 people for an outdoor wedding ceremony with an exceptional backdrop.